March is here and Fabiia is getting warmed up as we add some of the world’s best rattan furniture to our portfolio. Ideal for F&B, hotel outdoors and residential Patios, rattan is the best bet if you’re on the look out for durable, sturdy furniture. The range blends in quality of craftsmanship with iconic style and is a proud addition to Fabiia’s furniture collection. The popular Affäire collection is a combination of the amazing natural resource, rattan and a fantastic man-made synthetic fiber. The frames are made of rattan and the woven seats and backs, and the bindings are all made of polystrand synthetic fiber. This design dates back to the 50s and the 60s. Affäire is designed for upper end cafés, brasseries and restaurants in historical cities and capitals all over the world. Affäire is also an elegant choice for waterfronts, and a charming choice for the private garden or terrace. Within the ICONS Collection, you see revitalized, iconic pieces of furniture from some of Europe’s most skilled and important architects and designers. Arne Jacobsen, Nanna and Jørgen Ditzel, Viggo Boesen and Franco Albini were all pioneers of their time – they broke new ground when they made experimental shapes with the sturdy materials of rattan and wicker and created sculptural and timeless icons. Among the legends in this icon collection, Viggo Boesen’s FOX lounge chair won the design competition, that the Danish wicker-maker guild held in 1936. His inspiring, imaginative designs made him unique, and put him among the designers of the “Danish golden age”. Known as the best wicker maker in Denmark, Robert Wengler was an inspiration to many, now famous, architects who would come to his workshop to receive know-how and understanding about weaving and wickerwork. 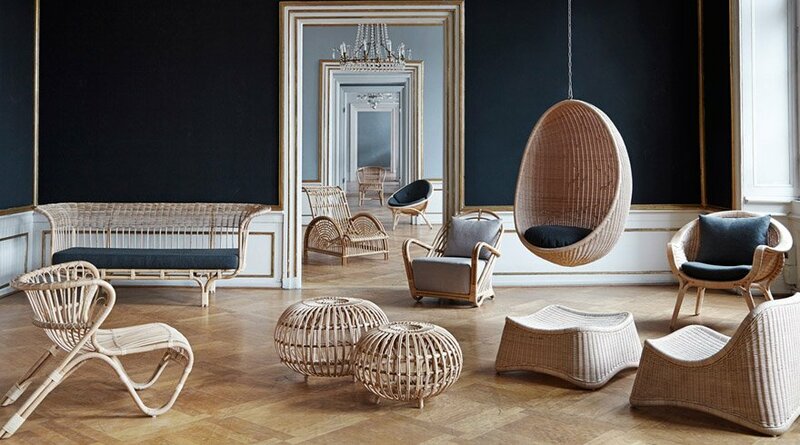 Today R. Wengler stands as one of the pioneers in rattan production. What he did to the craftsmanship and the way he challenged the material, paves the way for the way we know rattan furniture today. The Georgia Garden Collection was from the beginning inspired by the colonial style from the old british colonies, but also from old Danish willow chairs. The furniture is created by the old drawings of the original wicker furniture found in old books and from old postcards. Georgia Garden is made of strong and maintenance-free synthetic fibers woven on aluminum frames. Avantgarde is a unique collection of furniture designed for exterior living. The collection is created with an eye for the simple and solid elegance with an exclusive touch; all characteristics for Scandinavian design, which makes Avantgarde a timeless and sophisticated collection. Avantgarde is designed to focus on seat comfort and functionality, combine these assets with the Scandinavian design principles, and the result is a unique collection. Avantgarde is hand woven from an outdoor fibre on a strong hot-dip galvanized metal frame, which is powder coated to ensure a finish that can endure all weather types and temperatures. As a result, Avantgarde is maintenance free, weatherproof, washable, UV and temperature resistant, environmentally friendly as well as extremely durable. This makes Avantgarde an obvious choice for the Middle East region. Whether it is for an outdoor café on a boulevard or a beach side hotel or for a villa patio, this range of designer furniture is a perfect fit, bringing class with exemplary styling and great comfort. Get in touch with Fabiia today for enquiries and discussing new projects. This entry was posted in Fabiia Ideas, Fabiia News, Furniture and tagged bamboo furniture, cane chairs, cane furniture, danish rattan furniture, Designer Rattan Furniture, Garden chairs uk, Garden furniture, Outdoor chairs, poly rattan furniture, Rattan chairs, Rattan dining chairs, rattan furniture near me, Rattan Garden Furniture, Rattan outdoor furniture, Wicker furniture. Hi, I am looking for the fox wicker chair and see you supply them here in the UAE. Do you happen to know where I can purchase this chair in Dubai or Abu Dhabi? We are the authorized dealer in the UAE. Please send us your enquiry to dubai@fabiia.com and we’ll get back to you as soon as possible. Thank you.